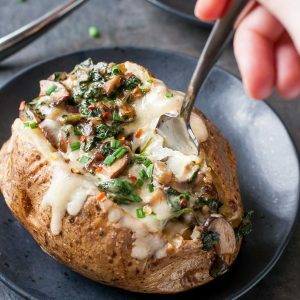 These Cheesy Vegetarian Loaded Baked Potatoes with Spinach and Mushrooms are packed to the brim with the most decadent sauce and a whole lot of veggie deliciousness! Pierce cleaned potatoes with a fork in 3-4 places and, for crispy skin, rub with a teeny bit of oil. Bake on a foil lined baking sheet for approx. 40 minutes or until insides are hot and fluffy. Alternatively you can microwave until beginning to soften, about 5 minutes. Flip and continue to microwave in 5 minute intervals, until tender when pierced with a knife. Set aside to cool slightly. Heat 1 TBSP butter in a large pan over medium-high heat. When butter begins to bubble, add mushrooms and cook, stirring frequently, until they start to brown and soften, about 7 minutes. Reduce heat to medium and add shallot and remaining butter to pan. Cook until shallot softens, about 1 minute. Add wine and cook until evaporated, 1-2 minutes. While mushrooms cook, arrange potatoes close together on a baking sheet. Cut across the top, lenghtwise, and gently squeeze in sides of potatoes to puff up the middle, pulling outwards slightly to reveal more of the fluffy potato center. Sprinkle with Cheddar and bake until warmed through and cheese is golden brown, about 5 minutes. Add spinach to pan with mushrooms over medium heat and cook until wilted, about 3 minutes more. Stir in heavy cream and parmesan, then season with 1⁄4 teaspoon salt and pepper as desired. Top potatoes with mushroom and spinach sauce and garnish with chives. TIP: If you wind up with a little crispy cheese left on your baking sheet after baking the potatoes with the cheddar, simply scrape it off with a spatula and use as a delicious garnish on your potato! Cook time is based on oven baking the potatoes. If microwaving potatoes, dish will be ready much faster.